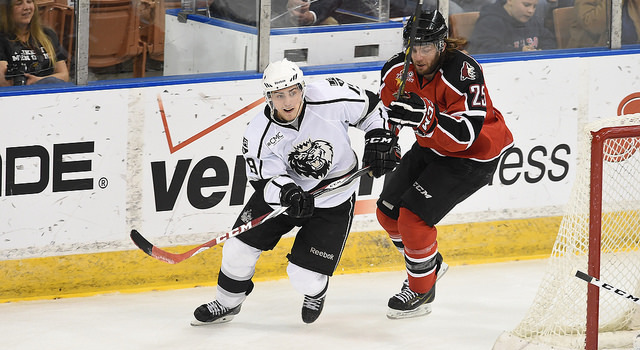 The Manchester Monarchs and Portland Pirates renew their acquaintances at Cross Insurance Arena in Portland, ME at 4:00 p.m. tonight in Game 4 of their best-of-seven first round Calder Cup Playoffs series. Manchester leads two games to one. There is a history between these two teams that meet regularly in the Eastern Conference’s Atlantic Division, and thus far, the physical play in the series is reflective of the rivalry. Also everything [Monarchs and Kings fans] would want: a win tonight to avoid a winner-take-all Game 5 Saturday night in Manchester. To preview tonight’s game and for an update on several Los Angeles prospects, I caught up with Stothers, the AHL’s Coach of the Year. His responses – except for a Nick Shore observation that will be saved for an LAK.com story tomorrow – are below. It’s actually been good in the fact that – and I can only speak for our team and I’m sure their team is the same after a long regular season – you jump into the playoffs and you play three games in the first four days, and the regular season is a big enough grind, and then you’re forced into it. It’s given us a chance to heal up some bumps and bruises. I guess that’s a good thing for us, but you don’t want your opposition to be able to heal up. It gives you a chance to get a couple practices in and be focused. You know what? It’s what you make out of it, too. You look at it as though ‘we’d rather keep playing,’ or it was tough those first three games, now you get to step back a little bit and go over some things and plan your game a little bit. I think it will be beneficial for us and probably important. He’s been real good all season long, but I just think he’s progressed and brought his game up to another level learning what it’s like to play each and every night, play consistently, and he’s learned to play like a pro. He’s hard on pucks, he’s a big body that’s not afraid to go to the front of the net. He’s not afraid to work the wall…and down low. He’s kind of a throwback in the fact that you really don’t have to tell him to go stand in front of the net and get in the goalie’s mind, he just does that. I think out of the 22 goals that he’s had in the regular season, I’m not sure he actually shot one in from any distance. They’ve all just been him getting in those dirty areas. You know what? He works on his game, like he works on his game all the time, and it might sound like a cliché, but he truly works on his game. He does everything the way that you ask him. He’s coachable and he’s got a passion in the need to improve, and he’s raised his level of play. He’s actually gone from a guy that maybe people questioned that his foot speed wasn’t going to allow him to get to the areas or play with certain individuals, but he’s proven everybody wrong, just because he’s worked so hard at it. I think he’s still a work in progress but it’s certainly plain to see that he’s a great kid, and he truly is a great person off the ice. I’m proud of the success he’s had this early in the development in his career. First of all, Dowd has been accustomed to playing maybe 30 games a year. He’s had adjust to the schedule and the amount of games and practices. Again, he’s another smart, smart kid. He’s good at figuring things out. He’s been great for us on faceoffs, he’s been really good for us on the penalty kill, and I think you could say he’s probably been more of a defensive-minded guy. But I think what doesn’t go appreciated enough is the plays that he makes. He can make plays in traffic, he can find the open man, and I think he’s another guy that’s only going to get better. He’s a little bit older. Dowder’s [24-years-old], but I think he’s pretty mature. But again, it’s a matter of being able to figure out the American Hockey League and what it takes game in, game out. He’s been real good and he’s improved a lot as well, and he’s played a lot. He plays in all situations and there’s a lot of needs and there’s a lot of onus on him and certainly when Shoresy’s gone, he had to fill a bigger void. Again, I think we’re good. Down the middle, if you can put out Shore, Weal, Dowd, Crescenzi, that’s certainly a scenario we should be proud of. I’ll save our conversation on Nick Shore for Friday’s LAK.com story. A live internet stream of Ken Cail and Chris Ryan’s call tonight is available here; if you’d like to shell out $9.99 for the AHL Live broadcast, click on this link. « Previous Post Poll: Which teams emerge from the Second Round?